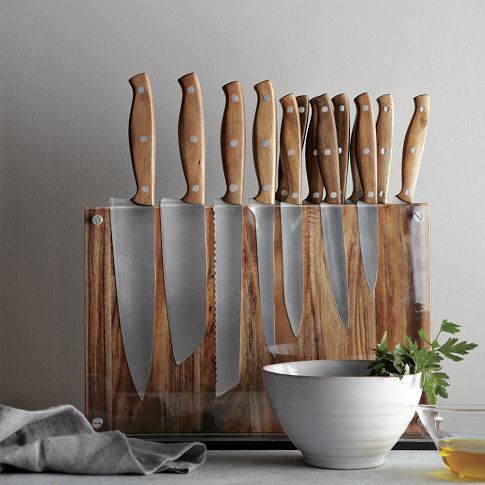 I love this West Elm knife holder! 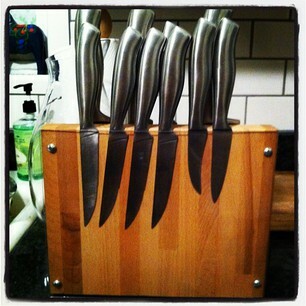 but $200 was way way way out of my price range, and I already had a great set of knives! Seemed like an easy enough hack to me. Some wood, screws, plexi glass. But who are we kidding, I have no idea how our table saw works, so I passed it along to Mr. W who did an awesome job. Our wood isn't as nice as West Elms but for about $10 in total costs I'm not complaining. We had this butcher block piece left over from our kitchen island, so that was free, then $8 ish worth of plexi glass, and some screws. This is our second West Elm hack this shelf was the first.